Don’t be fooled, winter in Montréal is no time to hide indoors! 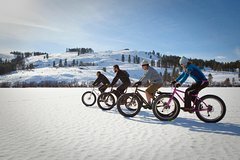 Discover the city in all its wintry splendor and join a brand new electric bike ride on a fat bike designed to grip on winter surfaces. Monster tires and powered wheels mean biking in snow is easy for both first-timers and seasoned cyclists. Ideal for those looking to try something new! Head to Mount Royal on this 2-hour fat eBike ride. Like the Eiffel Tower in Paris or the Empire State Building in NYC, Mount Royal is a natural landmark and a way to orient yourself in Montreal. Montréalers are proud of their "mountain". Though it's more like a large hill in the heart of Montreal, Mount Royal still draws anyone in search of nature and space. The public park also rewards those who make their way to the summit with a wonderful view of the city. The summit has a lookout and park designed by Frederick Law Olmsted, famous for his work on Central Park in NYC. Montreal's landmark park doesn't let winter cramp its style. Its 190 hectares (470 acres) offer some of the city's most stunning skyline views atop Mont-Royal's three peaks, the highest of which rises a modest 233 meters (764 feet) above sea level. It’s a sprawling playground that's perfect for cycling.